Andie and I celebrated our first conversation (one of the many anniversaries that we acknowledge) with a last-minute dinner and movie date. We saw the pre-screening of The Martian at the Rainbow Cinemas Market Square. 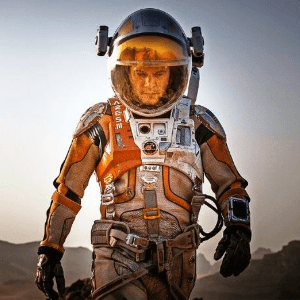 We are biased toward Ridley Scott and Matt Damon movies, admittedly, but we loved it — this movie does human moments well. In advance of your viewing, here are my non-spoiler (as much as I really want to talk about specifics) reactions to the movie. Everyone was good at their job, was allowed opinions and feelings, and gender and culture were not plot points. There was a mutual admiration between the characters and the solutions did not belong to just one point of view. The humour was a nice counterpoint to the tension but it was did not diminish the tone of the story. It was great seeing comedic performers be as equally serious and earnest as they were fun. Again it felt like everyone got their moment to shine. Some of my best friends are scientists. I am an admirer at best. The movie feels scientifically accurate except in those moments where the protagonist needs fiction to save them. I’m okay with that! There is a moment where I expected the music to well up into a certain KISS song from Bill and Ted’s Excellent Adventure. And for good reason — humans are coming together for a common good. Is there room for pessimism and evil? This movie is hell-bent on being feel-good, and rightly so. It doesn’t claim to be a perfect world with perfect people but it doesn’t reward the negative people with air time. I see a lot of narrative that gets tangled up in human pettiness and obstacles — its boring to me. I was glad this was not that type of movie. Could one thing improve the movie? Harping on the “bad” soundtrack was annoying. The thematic choice was low hanging fruit. While not my personal favourite style, music shaming is boring. Could this movie have starred a diverse performer? Yes. I think the movie would have had the same impact if Chiwetel Ejiofor switched roles with Matt Damon. Casting outside those in the film, Viola Davis. But as I admitted off the top, I was fine with this being a Matt Damon vehicle. Pun intended. Could the story have focused more on the man vs. self than the quest? That would be an interesting movie too. See this movie if you want to reignite your sense of adventure. Don’t see this movie expecting a documentary. The writing and directing for Star Trek: Beyond (and other scifi films) should use this film as a benchmark. Now playing at Rainbow Cinemas Market Square and other cinemas across the nation, I guess. Next Article Tomorrow night, laugh at us all night long!